Cost: The Year of the Rooster menu is priced at £93.88 (a vegetarian menu is also available at the same price), with beverage pairing (cocktails and wine) at £58 and the Orchard Flight (non-alcoholic drinks including tea and fruit juices) at £28. About: The 28th January 2017 marks the Year of the Rooster, and to celebrate HKK is offering a Chinese New Year (CNY) 8-course tasting menu until 12 February 2017, and then lightly modified until the end of March. Records suggest that the Chinese Imperial feasts in classical times often lasted for several days, and consisted of hundreds of dishes incorporating exotic and luxurious ingredients. HKK’s Chinese New Year banquet, created by Hakkasan and HKK’s Executive Head Chef Tong Chee Hwee, takes inspiration from this tradition, with modern interpretations of ancient dishes eaten by the royals. The menu features authentic Chinese ingredients such as sea cucumber, abalone and yu fungus as well as other fine ingredients like caviar, foie gras, lobster, fresh truffle and edible gold. The feast ends with a Century egg, a reinvention of the Chinese thousand year old egg; the HKK Century egg is a dessert flavoured with hazelnut, sesame and coffee, but more on that below. One-Michelin starred HKK is one of London’s finest Chinese restaurants, and a personal favourite. Its ‘Duck & Champagne’ tasting menu (£49 per person) available on Saturday lunch times only featuring its glorious signature cherry-wood smoked duck in a 4-course tasting menu with a bottle of Louis Roederer Champagne thrown in per couple, is still one of the best deals in town. You can see my earlier review here. What We Ate and Drank: HKK’s Year of the Rooster menu starts with a dish called ‘The Emperor's Bite of Spring’ - this was a golden rice pancake with king crab, white truffle, winter bamboo shoot, carrot and daikon, providing a range of textures and different flavours. 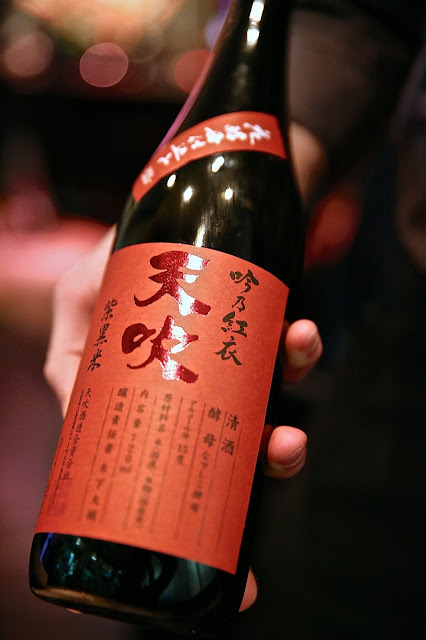 To accompany our first dish, we were served a glass of Amabuki – this was an elegant and light rose sake with subtle wild berry notes, made from blending white sake with red rice. The sake is made at the 300-year old Amabuki Brewery in Saga, in the southern island of Kyushu in Japan. 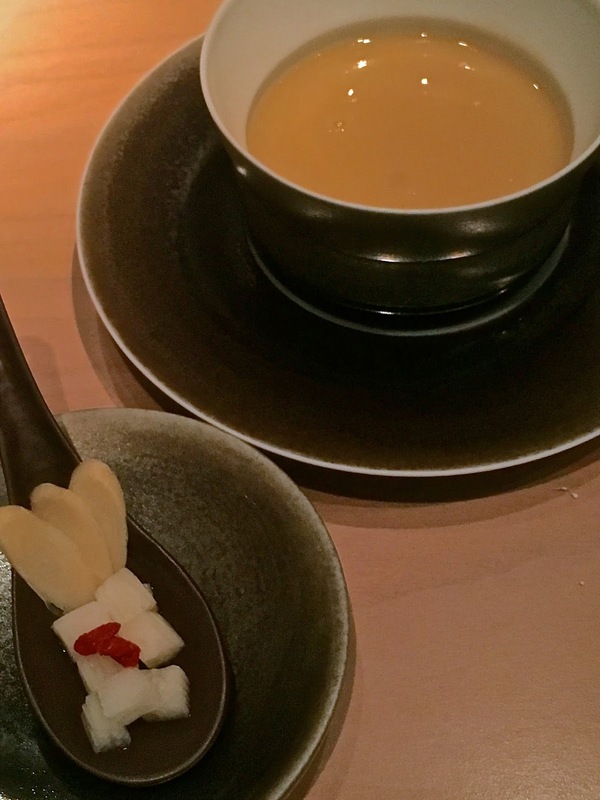 ‘Monk Jump Over The Wall’ is a traditional Chinese soup, and HKK's creamy version had green abalone, scallop, ham and sea cucumber. The soup was delicate but highly flavoursome (give me seafood and pork in a dish any day!) with the Japanese yam, ginseng and goji berry adding contrasting textures in a many-layered dish. 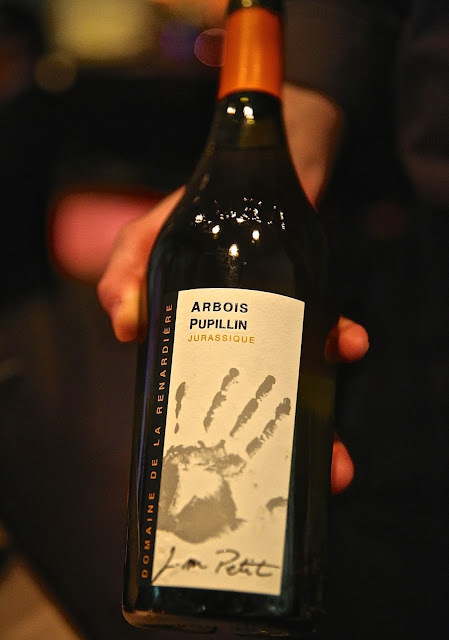 With it, our first wine was an Arbois Pupillin from Jura, a Chardonnay, from Domain De La Renardiere which showed great structure, minerality and steely green fruit flavours. Next was the ‘Touch of the Heart’ - a trio of dumplings: lobster and pickled Chinese leaves, king crab with XO sauce, and jade green dumpling of seabass and shrimp. Accompanying the dim sum trilogy, we had juice of honeydew melon, celery and ginger, served with a dinky glass jug of Peruvian Pisco. Creative as it was, to my mind it cried out for some ice despite the refreshing tartness. The Imperial Cherry Wood Peking Duck is the signature dish of HKK, and a must-eat dish in my opinion. The process of preparing this dish takes 2 days - first the duck is salted with lemon grass, before being showered in hot water, lemon juice and vinegar. It is then dried for 24 hours to separate the skin from its fat before being roasted in cherry wood, carved and served at the table. This elaborate process gives a skin that is as crisp as caramel, and full of aromatic flavour. We were served two morsels of HKK Peking Duck as part of the CNY menu - the first morsel had a generous slab of foie gras, topped with just the crispy skin of the duck and a slice of kumquat. The second had a pancake with breast of duck, leek and cucumber, topped with spoonful of Imperial caviar. This was an utterly delicious, sophisticated dish, worth a visit to HKK in its own right! 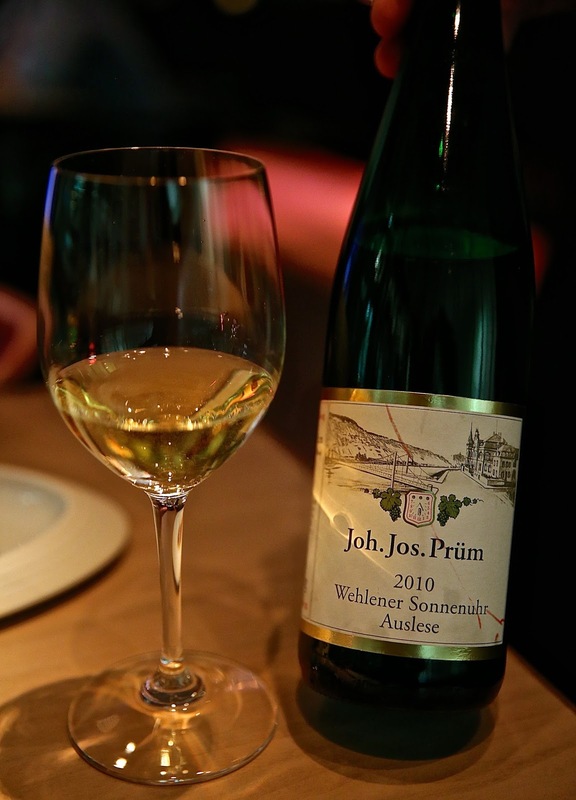 To accompany our duck, we had a glass of Reisling 2010 Auslese, by Joh Jos Prum, Wehlener Sonnenhur, from Mosel, Germany. A deliciously rich, off-dry wine with green apple and petroleum notes, this was a classic example of its kind. Moving on to the first main ‘Scallop Noodle’ had black yu fungus, lemongrass and royal chicken stock, Chinese broccoli and Japanese pumpkin. The scallops were admirably meaty and with a delectably charred flavour. With it, we were served a glass of Clos Mireille, a Provencal Rose blended from Syrah, Carignan and Grenache from Domaines Ott. This was a well made wine with delicate strawberry flavours, but a bone-dry nose. Following the semi-dry Reisling seemed a bit too much of a contrast for my palate. The final savoury dish was ‘Eight Treasure Chicken’, featuring guinea fowl, ginko nut, mangalica ham, shiitake mushroom and a salted duck egg yolk, all wrapped up in a crispy tofu skin. Dinkily presented in a cellophane parcel, at the table a little jug of osmanthus wine was poured over dry ice to give a suitably dramatic appearance to the dish. The flavours in the dish were rich and concentrated, the result seeming greater than the sum of its parts, and with its partnering wine, this was for me the climax of the evening. With the chicken, we had a glass of Morey Saint Denis, Aurelien Verdet, a 2009 Pinot Noir from Burgundy. 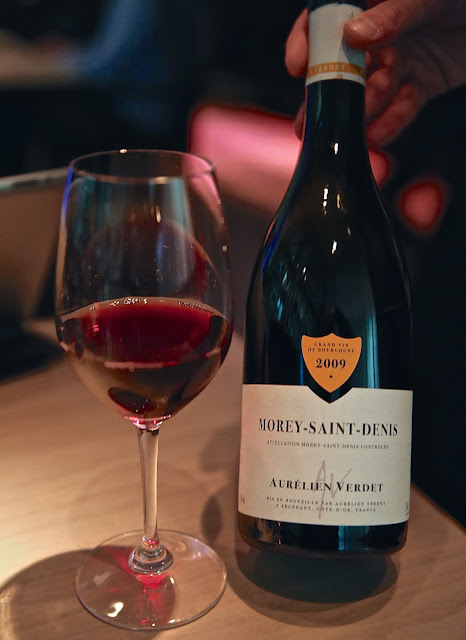 It had a complex nose of red berry fruit, leather and cedar, rich fruit on the palate and with a long, savoury finish. The pre-dessert was a light and airy Kumquat and Carrot Cake served with vanilla cream, orange foam and poached kumquat. 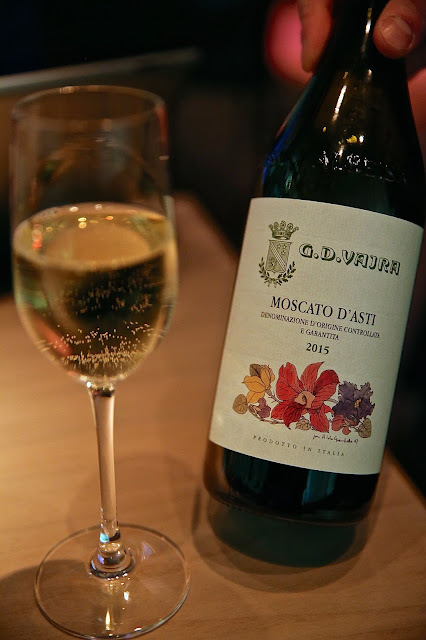 With the pre-dessert, we had a glass of Moscato d'Asti 2015, from G D Vaira, Piemonte, Italy. A slightly spritzy wine, this was light, refreshing, and medium sweet, with muscat grape flavours. The "Century Egg" was in fact a delectable sweet white sesame mousse, served with vanilla ice cream, caramelized hazelnut, sesame seeds and a coffee lady's finger, edible gold and a kataifi nest to resemble feathers. This was a great end to the meal - witty, creative, and a delight to the eye and the palate. With the final dessert, we had a glass of fine old Scotch whisky - a Glenmorangie Signet, made with chocolate burnt malt. 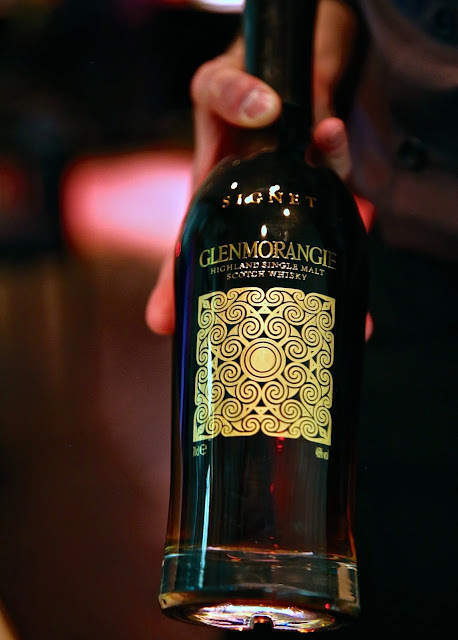 The whisky is matured in white American oak, and then cask-aged for 20-70 years. 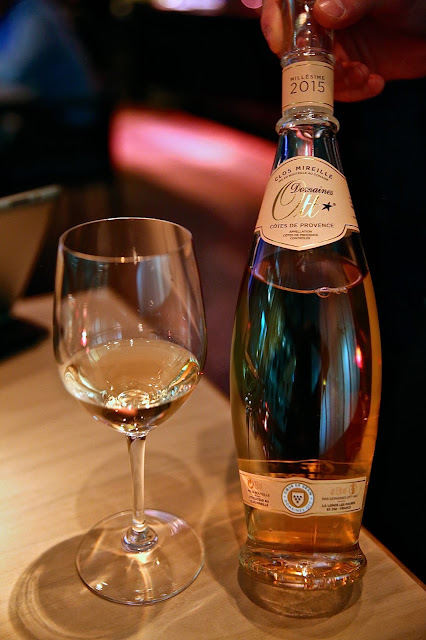 It is 46% alcohol, so is served with a pipette of water to release the aromas. Likes: Highlights for me were the Imperial cherry wood Peking duck, the Eight Treasure Chicken and the dessert of 'Century Egg". Dislikes: Some of the beverage pairings were not to my palate, although at best they were sensational. I would have preferred a wine flight to the mix of spirits, cocktails, wines and sake. Verdict: HKK London Chinese New Year Menu, the Year of the Rooster, is another triumph of flavours, colours and textures, and it is not to be missed. The menu is only available until 12th February 2017, so hurry! Highly recommended.